Chemists at the University of Amsterdam's (UvA) Sustainable Chemistry research priority area, together with colleagues from the Copernicus Institute of Sustainable Development of Utrecht University, have published the first techno-economic analysis of converting waste toilet paper into electricity. In the journal Energy Technology, they propose a two-step process and calculate a cost per kWh comparable to that of residential photovoltaic installations. Waste toilet paper (WTP) is not often considered an asset. In fact, most people usually prefer not to think about it at all. Yet it is a rich source of carbon, containing 70–80 wt percent of cellulose on a dry basis. On average, people in Western Europe produce 10–14 kg waste toilet paper per person per year. Accumulating in municipal sewage filters, it is a modest yet significant part of municipal waste. At the same time, waste toilet paper is a businessman's dream because it is one of the few raw materials with a negative cost. While this may vary across countries and regions, in the Netherlands wastewater treatment facilities pay around 70 €/ton to get rid of WTP. It is therefore an extremely attractive resource since people will actually pay you to take it off their hands. Being such 'true waste," WTP offers a great opportunity for closing loops, increasing resource efficiency and creating a truly circular economy. For the UvA's chemists, using WTP as a resource for generating electricity therefore 'the ultimate waste recycling concept." The Amsterdam region alone generates some 10.000 tons of WTP per year, enough to power 6400 homes. What's more, since the cellulose in WTP comes from trees, the electricity produced is renewable. This offers a great opportunity for matching society's demand for renewable energy. Renewable resources often show discontinuous peaks. Plant stems can be recycled, but only after the harvest; sunlight is available in the daytime (and depends on cloud cover); and wind supply is as predictable as the weather. Waste toilet paper, however, is a continually available resource. The Amsterdam-Utrecht research project, led by UvA professors Gadi Rothenberg and Bob van de Zwaan of the UvA's Van 't Hoff Institute for Molecular Sciences, proposed a simple two-step process for the conversion of WTP, creating a direct route from unwanted waste to a useful product. 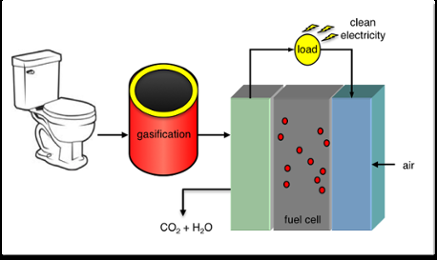 Master's student Els van der Roest examined the possibility of combining devices for the gasification of WTP (step 1) with high-temperature solid oxide fuel cells (SOFCs) able to directly convert the WTP-gas into electricity. The project's goal was to assess the feasibility of such a WTP-to-electricity system at a scale of 10.000 ton WTP per year, based on real-life parameter values. Using techno-economic analysis methods, the team presented a basic process design, an overall energy balance and an economic study for this concept. Data for the experiments and calculations were obtained in collaboration with the Amsterdam waste-to-energy company (afvalenergiebedrijf, AEB). In an open-access paper published in the international peer-reviewed journal Energy Technology, the researchers present the basic system design, as well as its electricity yield and overall efficiency, based on detailed mass and energy balance calculations. The overall electric efficiency is 57 percent, similar to that of a natural gas combined cycle plant. The levelized cost of electricity (LCOE, a measure used for consistent comparison of electricity generation methods) is 20.3¢/kWh. This is comparable at present to residential photovoltaic installations. The system's capital costs are still relatively high, mainly due to the fuel cell investment costs. But these are expected to decrease as the market for fuel cells develops. The operating costs are relatively low, partly thanks to the high thermodynamic efficiency (ca. 70 percent). The researchers expect learning effects could make the system more competitive in future, with an LCOE of about 11 ¢/kWh. The project team concludes that there is a future in turning waste toilet paper into electricity. "When we discuss these results with companies, people get very excited," says Prof. Rothenberg. However, no Dutch company or municipal authority has as yet been willing to invest in further development. The team is now considering taking their concept abroad: "We might see the first WTP-to-electricity plant being built in China," says Rothenberg.